When you want to sell your home, it’s imperative to maximize every feature, especially in your outdoor home. The worst mistake you can make as a home seller is to stage some areas and ignore others. All buyers are inquisitive and will inspect every nook and cranny. One of the features they focus on during the warm weather is the swimming pool. If you have one, make it your exterior’s crown jewel that will stop buyers in their tracks. If you lack ideas and are looking for inspiration, look to these. No doubt about it, you’ll make a lasting impression. A well-kept lawn makes a spectacular backdrop for your pool. Plant grass seed beforehand to give it time to grow. If you have a garden near the pool, plant some bright flowers for summer cheer. You can also buy some potted plants and place them strategically around the pool. These will not only augment the beauty of the space but also accentuate the natural features. However, be careful not to add too many flower pots as they draw attention away from the pool. Since the swimming pool is the centerpiece, all other accessories should be additions. Make sure the hedges and bushes are well trimmed and get rid of any debris. You can also enlist the services of a landscape designer. Cleaning is one of the most important elements of home staging, and your exterior home is no exception. The area around your pool should be spotless and the water crystal clear. A clean pool has an inviting aura. Filter the water the night before the showing and skim it in the morning to remove any leaves or insects that may have fallen in. Also, call a pool expert to have a look at the pool and the pool equipment such as ladders and diving boards. If you don't have time to keep up with your pool ensure you hire a pool management company to keep the chemical levels right and to keep it looking beautiful for buyer walk-throughs. Remember to remove any personal belongings like floaters or toys before a showing. They can make a space look disorganized and make the pool area hazardous especially if it is wet. To entertain buyers and create a homey look, you can place fruits and snacks on a table. They will be blown away by the crystal-clear swimming pool, clean surroundings, and delicious snacks. They will want to linger in the area. A swimming pool is never complete without inviting patio furniture to surround it. The right furniture creates the illusion of relaxation. It makes buyers want to sit and while away the hours. Place a few chaise lounges, recliners, and loungers around the pool. Depending on how much room you have to work with, you can set up a dining area as well as a lounging area. When potential homebuyers see the furniture, they will start daydreaming of days to come when they will relax and entertain in the space. 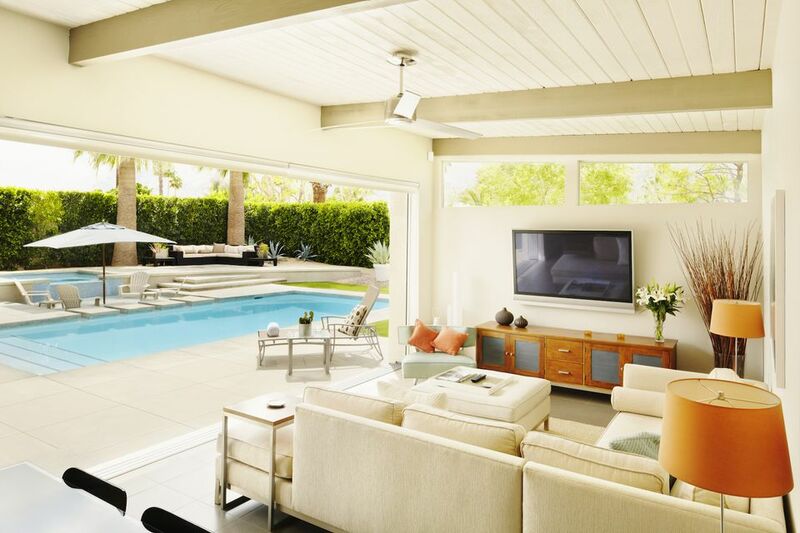 When adding furniture, embrace minimalism to avoid cluttering the pool area. For instance, you can choose seating which doubles as dining furniture. Multipurpose furniture is the best option for homeowners with small swimming pools. Most swimming pools are located in the backyard and are very hot in summer. Buyers might find it hard to stay in the area for long periods if there’s no shade. If the pool is one of your home’s selling points, it must have some form of shade. You can build a pergola to provide ambient shade or install cantilevers. If you don’t want to spend a lot of money, add freestanding umbrellas or shade sails. Place the fixtures on one edge of the pool to create a standout visual centerpiece. Shades add style and comfort to a pool area.